Data migration is the process of moving data from one or more sources into a target application. Historically, data migration has been viewed as the biggest risk in a new SAP ERP implementation, but with Utopia’s proven methodology and templates/accelerators, we help mitigate the risk of “go-lives” for our customers and system integration partners. As companies move toward the “digital core”, the migration and cleansing of their data is the first and most critical step—that’s a significant element of Utopia’s value. Loading required, accurate data as early as possible helps reduce project risk. Accurate and actionable data that is immediately available upon going live. Mitigating risk when moving to a new application, such as SAP S/4HANA. Utopia's 400+ SAP Templates reduce project cost and duration. SAP Rapid Data Migration accelerates your migration. Utopia only utilizes SAP’s Enterprise Information Management (EIM) solutions for data migration. Utopia’s Information Steward-Data Migration Content Extensions monitor the progress and quality of your data migration. Unique Utopia accelerators manage exceptions and automate template creation. Migrates both structured and unstructured data. 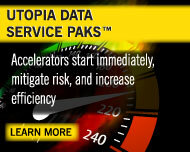 Learn more about Utopia's methodology, tools, and capabilities around data migration.